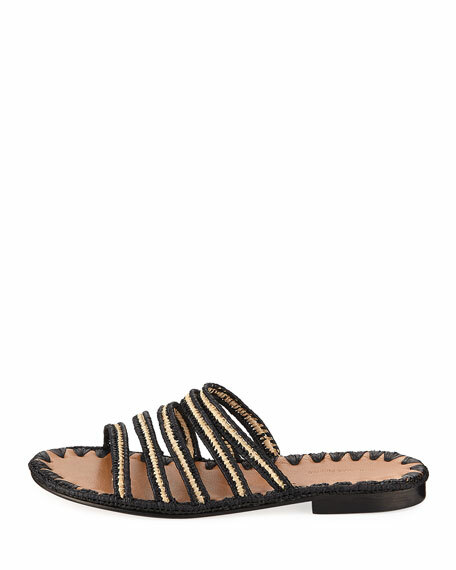 Carrie Forbes "Asmaa" woven raffia sandal. Christian Louboutin mule sandal in napa leather with bauble-studded detail. Flat stacked heel. Two-band upper. Signature red leather sole. "Simple Bille" is made in Italy. 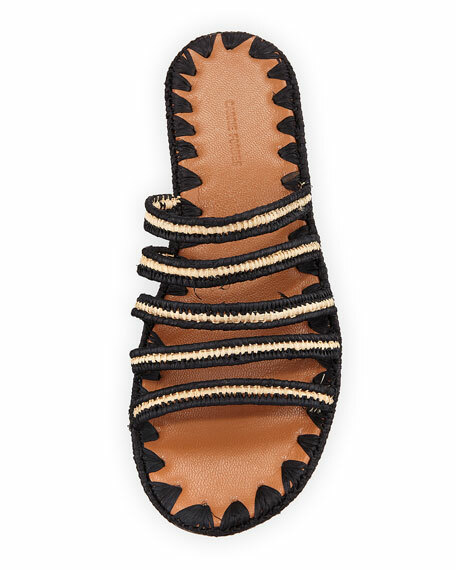 Robert Clergerie "Alba" leather sandals. 2.8" covered block heel. Open toe. Asymmetric strappy vamp. Adjustable slingback strap. Leather lining and sole. Made in Spain. Gianvito Rossi satin sandals in allover crystal beading. 4.3" covered stiletto heel. Strap bands open toe. d'Orsay silhouette. Adjustable ankle strap. Leather lining and sole. Made in Italy.